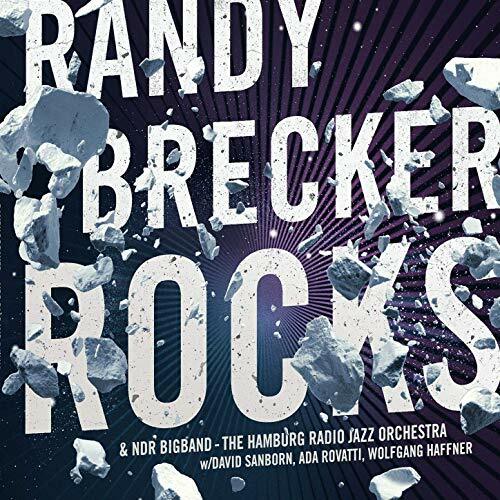 The way that the CD cover spells out “Randy Brecker Rocks” in bold white capital letters on a black background suggests that the renowned trumpeter and flugelhornist has taken to covering Led Zeppelin and Aerosmith tunes. That, to be sure, is not what’s happening here. Five of the nine tracks, including “Rocks” itself, are remakes of songs first cut by the Brecker Brothers, Randy’s long-running group with his late saxophonist brother Michael. Three others, among them the appropriately titled opener, “First Tune of the Set,” originated on 2013’s The Brecker Brothers Band Reunion, while “Pastoral,” conceived as a tribute to Jaco Pastorius, was first heard in 2001 on Randy Brecker’s Hangin’ in the City. The new versions came about in the wake of a pair of successful tours featuring Brecker with Germany’s decades-old NDR Bigband, which has long collaborated on stage and in the studio with visiting American jazz stars. NDR takes great care to avoid pushing the vintage material toward big-band cliché, instead retooling the songs from the ground up as contemporary works. Highlights? Take your pick: “Squids,” from 1977’s Don’t Stop the Music, retains its funky underpinning but takes on a greater level of intricacy; the polyrhythmic “First Tune of the Set” builds upward from a multi-layered foundation of percussion; “The Dipshit,” from the reunion set, largely holds on to the same arrangement as the original, but here it’s more expansive. Throughout, the musicianship is impeccable, and the integration of core quartet and orchestra is seamless. And, yeah, it does kinda rock. Preview, buy or download Rocks on Amazon!